So...I'm doing another read-a-thon this weekend! 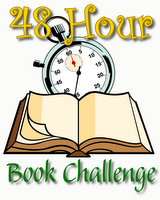 The Fifth Annual 48 Hour Book Challenge hosted by MotherReader is this weekend. I'm not going to be able to read for the entire 48 hours, but I'm planning on starting tonight at 7:00 pm and ending on Sunday at 7:00 pm. Are you joining the festivities this weekend?